What pleasant way to start a Sunday morning. I am sitting beside him in La Veranda Osteria, when he seizes my left hand in both of his calling me, “Sweetheart” and gazing intently into my eyes. No wonder he has had women on several continents and the odd island falling for him. My brother has had this ability to charm ever since he ran away to Europe with a backpack at 17. At the moment, he is trying to convince me of something, some better way to live, perhaps, but I am too overcome by his undiluted attention to take it in. Great to find this in a dinner date, even if he is your brother, but much more important in a doctor or medical practitioner. I remember sitting in a sound-proof third-floor office near LAX and being the focus of the undivided attention of my acupuncturist. She asked questions of such insight, listened with such concentration and considered me so deeply, that I felt entirely and absolutely loved. The interview itself was healing: there was no real need for needling. In fact, I have had a profound feeling of change for the better, just from talking to her on the phone. That was her goal – to be so present and available to her patients that they felt connected, not just to her but to the power that animates us. Having felt that connection and felt it repeatedly, it became easier for us to make it on our own. Actors and self-proclaimed gurus, who project charisma, attract us because they make use of this kind of focus although not perhaps with such benevolence. I once met an actor unexpectedly on my way down to his wife’s yoga studio and almost suffered third-degree burns from the radiance of his projection. I was gobsmacked, but I did not feel better for it. I do feel better when I can master the trick myself. The 108 moves in tai chi give me that opportunity especially when I find myself acting as Corner. (A Corner, as you might expect, is at the end of a line and so in a leadership role.) There is a lot of repetition in such a set, but repetition with variations. For example, there are 3 sets of “Wave Hands Like Clouds”, one of 5 of this sideways step with soft arm sweeps, one of 7 and one of 3. All of them begin from the position of “Single Whip” or “Whip to One Side”, but between the set of 5 and the set of 7, just when the sleepy Corner has zoned out, the move suddenly switches to “Fair Lady Works Shuttles” or “Four Corners”, an altogether more complicated move. I have often been embarrassed when I have missed that change, dissociated or planning dinner or gazing out the window. I was not in the now, not really present. When I do hit that groove, I experience a mental rest, like a moving meditation from the one-pointedness. It is easier than meditation for me. The kind of meditation I practise when I am able is mindfulness, just being aware of what is going on, especially internally, observing without attachment, as my acupuncturist would say – letting each thing go -each thought, feeling or sensation. It’s a useful technique when I am beset by anxiety or depression or pain. If I sit down, just sit, not cross-legged or full-lotus nor even necessarily straight-backed, but easily, and observe what is going on in me, I gain some distance. I am watching what my mind is doing and so I am now in the role of observer, not sufferer. I am no longer my discomfort. I can stop spinning. I have heard that the goal of meditation is to still the mind. I don’t aim that high. But if I pay attention to it, it stops screaming in agony, like a crying child when her mother holds her and gives her her attention. It may well be that there is no solution. The grief cannot be assuaged. A fearful situation cannot be resolved. A physical pain is intractable. No matter. All these things are more bearable when looked upon steadily. It doesn’t even have to be a look of love. Did my acupuncturist actually loved each of the parade of people who sat before her? (Of course, she did me.) She became absorbed in them so that there was no longer a separation between her and other. No other in fact. In the same way, I can reclaim my anger and self-loathing, my fear of ageing and death, whatever negativity is plaguing me. Once reclaimed, these parts of me seem to shrug and get on with life. It is these negative feelings that prevent us from focusing, both on others and on our own mental health. Eckhart Tolle has written several books, including The Power of Now to extoll the virtues of focusing. Jon Kabat-Zinn has told us how to heal ourselves through mindfulness in Coming to Our Senses. I have read these and others and found them inspiring, but it is simple practice that gives results. Like tai chi. We don’t really need to read more. We just need to do it. “Attention must be paid,” Arthur Miller said in Death of a Salesman. “Pay attention,” our parents and teachers admonished. Yet we seldom do. We need something like the little bell that Buddhists sound during meditation calling out, “Be here. Be now. Wake up”. Love is just that: being conscious. 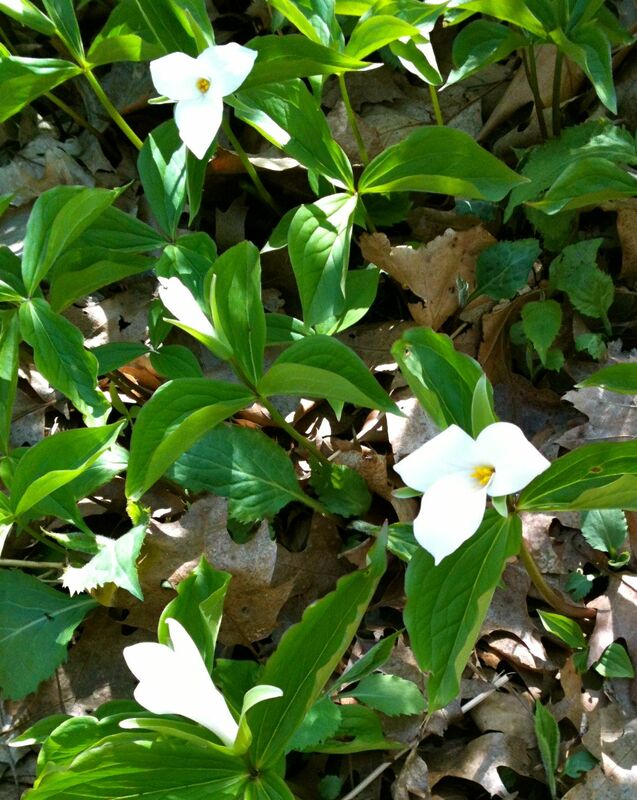 I went to the woods to see how the trilliums were doing. It has been an exceptionally early spring here in Toronto after an unseasonably warm winter with very little snow. They say things are about a month ahead. The magnolias paid a price for early budding when the temperature suddenly fell below freezing, but many of them just marked time in the bud stage and opened up in pink glory, only a little brown at the edges, when things warmed up. Now light green leaves are feathering out on some trees, so the trilliums, I reasoned, should be blooming before the trees cut off their light. Trilliums have a sort of magic about them. They are highly regarded here because they are Ontario’s floral symbol and school children are taught NEVER TO PICK THEM because they will not grow back. I had walked down the paved bicycle path into the park but left it to cross a culvert over a brook and climb up into the woods. The woods grows on sand dunes left here by an ancient lake, so there are sunny hillsides under the trees and it was on one of those that I found the trilliums. The lily of the valley leaves had also pushed up and were waiting their turn to unfurl with their heady perfume and a few violets lined the path. I followed a freshet on a rough path, climbing over tree trunks, which on a warmer day would have tempted me to sit and stare. I came to an open field, already mowed, where families like to come to picnic. Then I turned east and began the climb onto a high ridge. Here the trees were still bare, but the bushes were green and there were masses of white flowers, which I have yet to identify. There has been a tidal wave of butterflies this spring, mostly red admirals. One report told of a backyard covered in 2000 of them (How did they figure that?) Some of them were sunning themselves on the ridge path and as I approached they flew up and chased each other in circles. I was still wearing a huge grin when I met a man and his dog. On one side, I looked down into the woods and on the other out at the city -street, railway, freeway, high rises, and beyond them Lake Ontario, deep blue for the nonce. The week had brought a weight of difficulty as weeks often do. There were unresolved problems and uncertain outcomes. There was negativity to be processed. But here there was a sanctuary in the woods. Here there was stillness that comforted. Here there was peace. Have you found such a place lately? Perhaps it was not even external. Perhaps you found it within. Tell us about it. Zazen just means sitting, but we usually think of it as sitting in meditation. The idea is to quiet the mind in order to be with a deeper part of self, to gain a measure of peace. Eckhart Tolle in his book The Power of Now describes it as being in the now, not anticipating the future or regretting the past, not planning, worrying, or processing, just being. Here we contact eternity, which is not, after all, in the future. Here we can find ourselves in heaven, which is not, after all, in the sky. No doubt it is possible and in the forty years I have been at it, I may have actually got there a few times. Nowadays, there’s stuff in the way – wasn’t there always? – obsessive thoughts, runaway feelings, aches and pains. So I begin with the journal to give the mind a free rein, let it think all it wants and report back. It does run on, usually for half an hour and 4 or 5 handwritten pages. Then it’s the body’s turn to do the jongs or exercises associated with tai chi. This takes 15 minutes or so and leaves me limber enough to sit, but not, alas, to sit in full lotus position. Only now do I find it possible to let go of the racing mind. For whole seconds at a time! Spiritual practice is always an individual choice, don’t you think? Whatever we do on a regular basis with concentrated focus can lead to self cultivation. Journaling can be a meditation.